Барааны дугаар 9780199541447. Categories: Dictionaries, OXFORD. 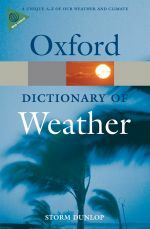 An authoritative and wide-ranging new edition of A Dictionary of Weather containing almost 2,000 entries on all areas of the subject. Provides clear definitions and illustrative examples of terminology taken from meteorology, forecasting, and climatology. Revised and fully updated, this edition includes 300 new and revised entries, such as A-Train, Pineapple Express, and Watermelon snow, and added feature entries highlighting actual occurrences of extreme weather, including the Indian Ocean Tsunami and Hurricane Katrina. Generously illustrated, and containting recommended websites for further reading, this reference work is thoroughly comprehensible. Find out where and when the world’s largest hailstone fell or where the highest temperature was recorded using the list of weather records, and check climate data for different weather types from around the world. Key terms from the related fields of oceanography, hydrology, and climatology are also covered as well as biographical information on important people in the development of meteorology. Arranged in A-Z format, it is a unique dictionary and an essential reference source for meteorology and geography students, whether at school or university, as well as for amateur meteorologists and the general reader. Readership : This is an essential reference work for meteorology and geography students, whether at school or university, and amateur meteorologists. Also of interest to the general reader.